I've officially given up on trying to "be good" about eating healthy until Christmas is over. I'm just going to relax and enjoy the next couple of weeks. I couldn't help but notice these cookies on the shelf at the grocery store and they were on sale for a great price so I grabbed a box. They are so delicious! 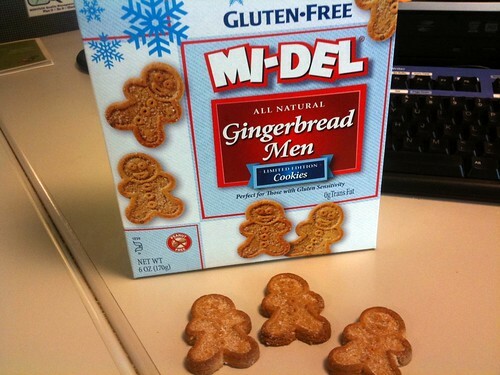 I love Mi-Del ginger snaps so I knew I'd love these too. And I did. Over a span of about 2 days. Whatever. On a healthier note, we are doing very well with grocery shopping and eating more meals at home. This week B made a delicious dinner for us - chicken breast stuffed with spinach, tomato pesto and goat cheese, breaded in gf bread crumbs, cooked on the stove top in a little oil for a few minutes then baked. It was so so so good. Surprisingly I tolerate goat cheese quite well. I don't eat a lot of it, mostly because it's so expensive, but I do really enjoy it. This meal tastes a little bit like pizza, I said it was the closest thing to real pizza I've had in years. I can't wait until we have this again. Last night I made mustard breaded porkchops with broccoli and sweet potatoes. Delicious as usual. I keep forgetting to take photos so I can write proper posts, but I'll get back into the swing of things soon. This weekend is my niece's 2nd birthday party and we also have a couple of Christmas parties to go to. I'm making the meatballs for my family party on Saturday. I'm making fudge for my work Secret Santa. Lots of cooking to do this week!! Hopefully I won't forget the photos! Hi! A friend of mine sent me along to your blog in the hopes that it would help me. I've been diagnosed with Crohns since 2004 and since then I have been hospitalized three times, and recently had a bowel resection in which they removed most of my small intestine, part of my colon, and my appendix, all while I was 4 months pregnant. Trying to handle having Crohns and a baby is even more challenging then I thought. it would be. My brother recently got diagnosed with Celiac, as well as my niece and he said it's likely that I may have it as well as having Crohns since they share the same genetic links. I knew nothing at all about Celiac or Gluten so after extensive research I figured what the heck, I'll try anything. I haven't had a normal bm in over 3 years so I'm pretty much willing to try anything anyone suggests. I have been gluten free, dairy free, and vegetarian for a little over a week and while I feel more energetic my bms are still not normal. As someone who has Crohns and says the gluten free diet helps, how long did it take you?